War games that take place on a hexagonally-divided map have a long and storied history pre-dating computer games by decades. Probably the most famous of these are games developed by Avalon Hill and SPI—titles like Panzerblitz and Air War. Better still, if you remember SSI’s Panzer General game for “classic” Mac OS, you’ll have an idea of what to expect. I’m delighted to see this wonderful tradition continue with Slitherine Strategies’ excellent Commander: Europe at War, now published for the Mac by Freeverse. Commander: Europe at War takes you back to what’s been the inspiration for so many strategy games over the years: the European theater during World War II. It’s a “grand strategy” game, so you’re putting your entire alliance’s forces and economy into play to win. You can play either as the Axis (in this case, Germany and Italy, as play is restricted to Europe) or the Allies (the U.S., Great Britain, and Russia). With each turn, you mobilize your forces, moving them against the enemy, and make decisions about production—where you’ll build new forces and how you’ll deploy them once they’re built. You have control over a mechanized army, air force, and navy, so you really need to be on your toes to make sure you’re covering everything you need to be. Too often strategy games get bogged down in “micromanagement”—forget to give a minor order to a production unit or a military unit, and you’re dead in the water. Fortunately, Commander: Europe at War doesn’t suffer that problem. Slitherine has been careful to balance not only the game’s design but its interface so you have a clear and almost immediate understanding of where your troops are and what they’re doing at any given time. There’s no complex multi-layer interface to uncover what’s happening—it’s all pretty clear from the first move. One rather odd design conceit of Commander: Europe at War is that you’re playing as an entire side in the conflict—Axis or Allies—but you’re managing each of the superpowers that comprises that side separately. If you’re playing as the Allies, for example, you’ll need to keep an eye on separate production and unit control of Russian forces, U.S. forces, and British forces, rather than a single unified “side.” As the conflict grows—and this is a world war, after all—keeping track of all of those units can be a little overwhelming. But Slitherine’s done a good job of keeping the interface simplified enough that you should be able to whip through turns fairly fast. To keep your forces refreshed and up-to-date, you really only need to earn production points from having cities (though the Allies, dependent as they are on the Yanks, must have working convoys to keep their supply lines operational). You can repair existing forces, too, bolstering their strength as they face invading forces. Commander: Europe at War breathes new life into the hallowed genre of hex-based strategy gaming. Research plays a role, too. You can invest your nation’s wealth into improving the efficiency and the strength of your war units, whether you’re building subs or doing dogfights in the skies, improving armor ratings or developing anti-tank guns. Again, the game’s developers have kept the muss and fuss to a minimum here. Of course, that’s a double-edged sword. Some grognards (that’s fancy-talk for “war game enthusiasts”) may prefer a deeper gameplay experience, but I found it quite refreshing and really appealing. A tutorial mode helps walk you through the interface and does a marvelous job of explaining how the game works. It’s worthwhile to run through it, and entirely possible to run the game without reading any documentation as a result. The game’s graphics and sound are good, but not spectacular. There’s no real animation to speak of here—you’re watching static icons for each unit move over the hexagonal grid surface, and you may see some flashes indicating that different units are fighting each other, accompanied by sound effects (bombs dropping, artillery and weapons firing, and the roar of tank and airplane engines), but you’re not going to see any detailed 3-D graphics here. That’s surely a turn-off to some gamers who expect a cinematic experience every time they fire up a game, but for those people, there’s always Command & Conquer 3 or other games. 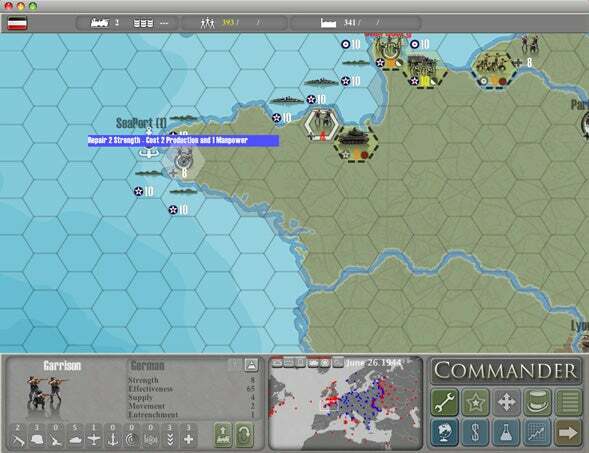 Commander: Europe at War bogs down a bit as the conflict grows larger; my system was well within the recommended system requirements, but I still found myself waiting for something to happen as the war dragged on to events like D-Day. When you start a game, you can adjust a few options, such as whether you’ll play as the Axis or Allies, whether either side has an advantage, and when you want to start playing (any period from 1939 to 1945). There are a few events “set in stone,” by the way—the United States doesn’t get involved in the conflict until 1941, as an example. So Commander: Europe at War may not be the best for grognards looking for “What If” scenarios. The game also supports multiplayer play, either by hot-seat, direct TCP/IP connection to another machine, or Play By E-Mail (PBEM). A demo is available, so make sure to check it out before you plunk down your cash. Commander: Europe at War isn’t the flashiest strategy game ever, but it’s a welcome respite for gamers who miss turn-based strategy games like the old Avalon Hill variety.